Olbermann, as far as I understand it, is not actually running a presidential campaign, so really what he says matters about as much as what anybody else on TV says, whatever network they're on. I have to say that it warms my heart to see people abroad waving American flags again. There is an opportunity for a different kind of global politics after the last 8 years and I can only hope that Americans embrace it in November. No. Olbermann distorts the truth and is more dishonest than anyone I have ever seen in the news business. It matters when people watch his show to get election information, and it's so blatantly one-sided. I was thinking the same thing. 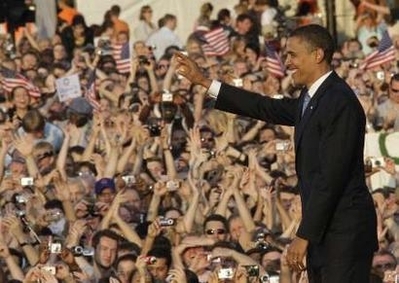 The image of Europeans excited about America and waving American flags rather than using them in protest is a stark contrast against what we've been seeing the last 8 years, and it's such a wonderful feeling. I don't watch Keith Olbermann for any information. I think he's just as obnoxious as O'Reilly and when I see him I change the channel I don't consider him to be a news person, he's a commentator like O'Reilly is. this from a Rush listener? i didn't see the speech, but i did just read it. it made me choke up. Rush doesn't act like he's unbiased. Olbermann acts like he's just looking out for the folks from both sides, but, surprise surprise, it's only the Republicans who do anything bad and Democrats are perfect. I can't imagine anyone listening to Rush without knowing who he is or where he stands politically. I can't say the same about Olbermann. He is irresponsible. Rush also doesn't moderate election night coverage. it made me choke up. I'm sorry, but I had to laugh when I read that. I could only stomach watching some of it, and it was laughable. I'm tired of Obama and all Democrats talking about how we need to be "citizens of the world," as if there is something wrong with being an American. Obama mentioned how "the world" came together to rebuild Germany. No. The United States rebuilt Germany. "The world," including Germany and all of Europe is doing next to nothing about the problems in Africa. The United States is doing the bulk of that. Where's the talk of American exceptionalism- from either candidate? In contrast...McCain stopped by a German restaurant in Ohio during Obama's speech...that made my Mom and me laugh so hard we had tears streaming down our faces. There's just no comparison. What a welcome change abroad. Being citizens of the world does not equal anything wrong with being American-it's the exact opposite. People in other countries, and many people here, have had it with the arrogance of the last eight years that has created anti-American feelings (personally I wish some people would stop lumping all Americans in with Bush but that's another story). If you can't see that well no offense but you must be living under a rock or in denial. The US is nothing without the support and friendship of "the world". We used to have it and we need it back. That's what Senator Obama is talking about. I'm tired of Obama and all Democrats talking about how we need to be "citizens of the world," as if there is something wrong with being an American. I was born in Eastern Europe, moved to Western Europe as a child, to Canada as a pre-teen, and am now in NY. I consider myself to be a citizen of the world and I think it is only a good thing that I have lived in so many places, and have acquainted myself with so many cultures, and learned to speak so many languages. I strive to be a citizen of the world, and that does not denigrate my formal citizenships, nor the countries I have lived in nor am living in. If you don't wish to be part of an increasingly global community, that's your prerogative. But you will be left standing with a small crowd of like-minded people, because time and progress are just going to steamroll right over you. this is why they hate us. the Europeans. and this is why we're going to be left behind if we continue the narrow-minded, nativist perspectives exemplified here.